Prism Debuts on House Hunters International! I am addicted to the HGTV network. My favorite show is House Hunters International followed closely by Property Brothers and Sarah’s House. The other day I was watching a House Hunters International episode that was filmed in Barbados. 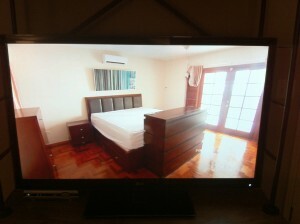 The home hunter enters bedroom during home showing and BAM! There is one of our TV lift cabinets. Do you recognize the TV lift cabinet within this bedroom? It is our very own Prism Espresso! Can you imagine my surprise and delight of having one of our cabinets make it all the way to Barbados? I was thrilled. In honor of that episode, this week’s product focus of the week is the Prism Espresso. The Prism Espresso is modernly designed with clean contemporary lines. The bottom of this cabinet has a concealed drawer that features flip down panels for access on either side. The drawer space can store very comfortably two electronic devices. This cabinet features our built-in rack and pinion lift machine and infrared relay system. The IR system allows TV lift owners to operate electronics such as cable box and DVD player without having direct line of sight. This means that electronics can remain hidden in bottom drawer and still be controlled by remote control. Simply plug and play!